There's a new RNC ad that warns of more cataclysmic terror attacks against the U.S. homeland, naturally only if Democrats should get elected. The ad portrays Osama bin Laden and his top lieutenant, Ayman al-Zawahiri making threats against America dating back to February 1998 including bin Laden's Dec. 26, 2001 vow that "what is yet to come will be even greater". "These are the stakes," the ad concludes. "Vote November 7." The ad uses the usual fear tactics, smearing Democrats as unable to secure America. Throughout the piece phrases like "kill the Americans," "inside America," "suitcase bombs" and other dire messages float around a photograph of bin Laden. The background is a ticking bomb. Finally the ad concludes with the words, "These are the stakes." Note please that the words ‘violence' and ‘death' are missing from that definition. 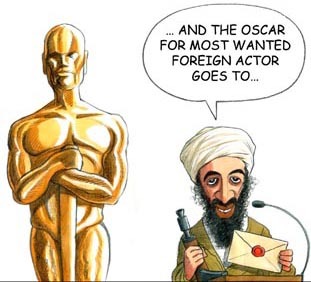 For the key to terrorism is not the act-but the fear of the act. That is why bin Laden and his deputies and his imitators are forever putting together videotape statements and releasing virtual infomercials with dire threats and heart-stopping warnings. But why is the Republican Party imitating them? Bin Laden puts out what amounts to a commercial of fear; the republicans put out what is unmistakable as a commercial of fear.The Republicans are paying to have the messages of bin Laden and the others broadcast into your home! Only the Republicans have a bigger bankroll. 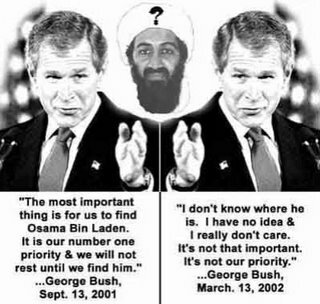 "The truth is that, under the incompetent GOP leadership, led by President Bush who moved our special forces out of Afghanistan, Osama bin Laden is still on the loose and the Taliban is resurging in Afghanistan," said Democratic National Committee spokesperson Karen Finney. "Under the GOP watch, our troops are pinned down in the middle of a civil war in Iraq, North Korea is testing nuclear weapons, and our troops still lack adequate body armour." All it does is create fear in the hope of securing their own backsides and holding on to everything it can in the coming mid-term election. But the good news is Democrats have nothing to fear. We will win back our country.